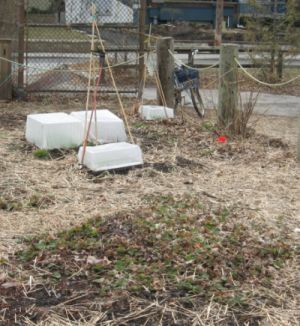 Neighbours from a local apartment building, having no other earth-friendly location for managing kitchen scraps and related biodegradable materials, have been bringing their compostables to Riverdale Meadow Community Garden for years. While Norah and Firmo, among other neighbourhood compost contributors, don't garden with us, we're proud of the connections beyond food production that are possible here on the school's grounds. > Displaying to passers-by (students, neighbourhood, tourists) Toronto’s greening and local-foods and food-security initiatives; especially appropriate here for Ontario Native Species, given the geographical nature of the meadow, and its proximity to the Don Valley – all in keeping with the 2000 pledge by Toronto City Council to have community gardens in every ward. 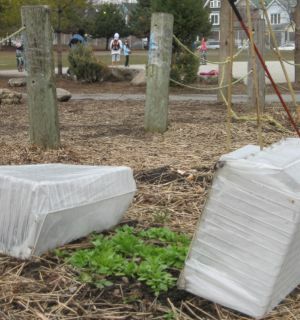 This garden host tours for garden leaders and groups from across southwestern Ontario, representing TDSB and CALC as a landlord positively involved with community initiatives and greening, though the school's quadmestered students do not particpate in gardening here. en route to the community garden. from their casual, neighbourly connections and informal exchanges of plants, ideas, resources. > All of the above is being done without any funding, staff, or formal garden programs. 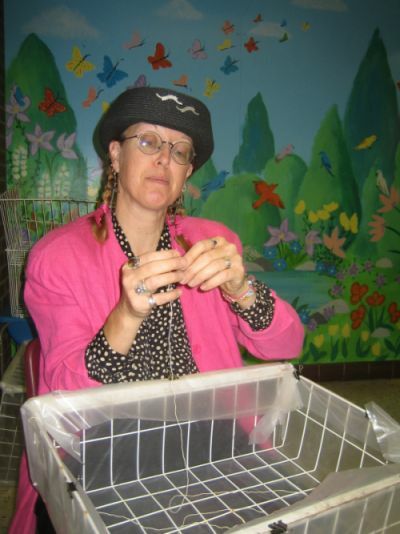 The garden receives infrequent donations, mostly of recycled materials and occasionally small cash offerings (between $50 to $300; once a $500 grant); other than this all funding is accomplished by collaboration with neighbours for plant sales. Here again, the garden’s activities represent to the general public and community partners the generosity of CALC and TDSB. We are very grateful for the tap for water CALC continues to provide. > A fair estimate of the volunteer hours of the gardeners themselves would count into the thousands each year. This not only provides food, exercise, human connections and learning opportunities, but also fosters such programs as that when Toronto East General Hospital’s diabetes program’s promised garden location was deferred. RMCG hosted their pilot program that year. As some of the garden’s members, over the years, have had challenging physical and mental health issues to face, the garden has provided something formally recognized as horticultural therapy – what we consider literal grounding. 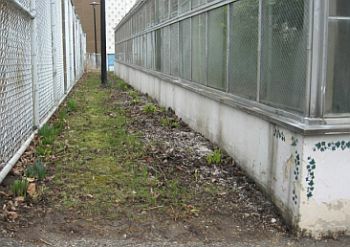 TDSB’s hosting of RMCG at CALC provides untold well-being to the gardeners and their individual communities, the local neighbourhood and other city-related initiatives, at probably less cost to the Board or school than any other such garden. > Volunteer Hours for students enrolled at CALC could easily tally in the hundreds each year. Either on a drop-in, or by-appointment basis on lunch hours, or after school on weekdays -- whenever the garden’s coordinators are present, or at our formally organized twice-monthly evening-and-weekend Work Bees (see our Membership Information / Work Bees page via the green menu, upper left) to participate with the broader membership and community volunteers, CALC students have the opportunity to engage with a diverse community and with the land itself, focussed on sustainability issues, greening and food production practices, and innovations into eco-sensitive developments. Gardening, broadly speaking connects to all aspects of formal learning, be it maths, sciences, (local) history, arts, or nutrition as well as connecting people intimately to the soil, the flora and fauna. We welcome support from CALC in more formally advising the students of this opportunity to contact the garden coordinators to make arrangements; no administration other than posting a flyer or making a public-address announcement would be required to benefit the garden, the students, and the image of CALC and the TDSB. At Jackman Public School: stitching plastic to wire cages to create the simplest of ColdFrames for growing leafy greens through the winter. The leaf-strewn then snowy ground around the ColdFrames will never look as enticing as Jackman's hallway mural - the back drop here - but it gives us all hope for the coming warmer seasons, both for growing so many more local foods and for connecting with all the bounties of nature. Wire Cage Covers, the simplest of ColdFrames, shelter seeds just planted in October for growing leafy greens right through the winter. Strawberry plants donated by Riverdale Meadow Community Garden are the green patch, centre background. Jackman received Kyla Dixon-Muir's text Growing to Eat through all four seasons (Cloches, ColdFrames, Hot Beds, Raised Rows, and more) as a gift, to continue developing more Season Extension Techniques. This is just one of many innovative and imaginative gardens on the school's property. 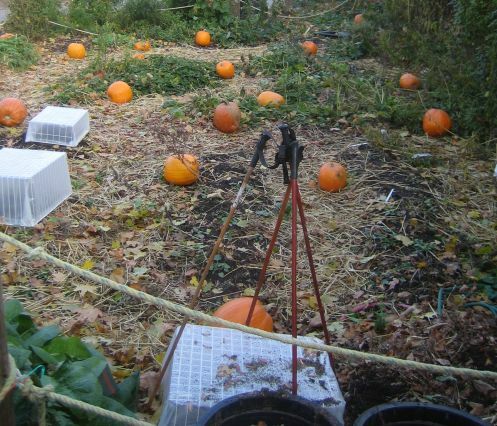 Foreground: Wire Cage Covers, are opened to show growth that took place through the winter in these, the simplest of ColdFrames. Background: School children frolic in the playground after classes, growing themselves, enjoying the outdoors in lighter clothing. Jackman School boasts the city's first retrofit Green Roof, another innovative practice involving and teaching the schools children and the neighbourhood about greening initiatives and Ontario Native Species plants. Gardens tie into the classroom curriculums in all the ways listed in the points above, as benefits to schools, communities, neighbourhoods. Exchanges between gardens benefit the whole community. Here, bountifully successful strawberry plants received from Riverdale Meadow Community Garden will bear fruit before the school year is over. See this website's Donations page (click on the green menu upper left) for photos of children enjoying strawberries last summer. Without any formal programs or official meetings neighbours with common interests chat by email, telephone, on city sidewalks while doing errands, and through casual introductions to other like-minded contacts city-wide, creating a web of contacts that benefit all. Truly, this is community, in all senses of the word.